After 32 years in Banking, I was not looking to venture into another career. In fact, I was happily spending my retired time gardening, traveling, reading and resting. This ideal situation lasted about 6 months. Several years before I accepted a "Let's Take a Stained Glass Class!" challenge from my friend. Soon, I was hooked and as with all new hobbies, I gradually started making gifts for family and friends. The Stained Glass projects lead to Fusing, Slumping, Jewelry Beads and Etching ideas. In a few short years, everyone I knew had received samples and gifts of all the Stained Glass, Fused Glass, Beads and blown glass I had made; so, when the Holidays were approaching I realized I needed something new and different for gifts for my friends and family. As a teenager, we used to introduce empty pop bottles into the fire pits when we would go camping just to watch them melt, twist and eventually crack. 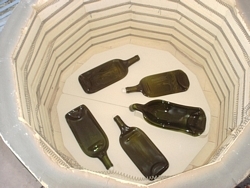 The idea to melt bottles is not a new one, but in a kiln where the temperature can be controlled, the results following the melting are much more successful. I spent the entire summer drinking wine....seriously, I am not what you would call a BIG drinker, so I needed all the help I could find. After several months I had polished off about 6 bottles and eventually took them to the local Stained Glass Shop to have them melted for me in their kiln. My gifts were instant hits and once the Holidays were over I began to receive calls requesting additional trays. Initially reluctant, I was soon busy making more gifts for birthdays and other special occasions. Production rapidly outstripped the supply of wine bottles. No longer being able to personally keep up with production, my friends suggested that I approach local restaurants and ask for their empty wine bottles which would otherwise end up in the dumpster. Soon there was a regular supply from the Olive Garden Restaurant where they saw this 'recycling' effort as a way for them to participate in an "Earth-friendly" program. I am very grateful for their continued support and in return I provide finished trays to them for Employee Incentives. This has become a real WIN-WIN for everyone. Mass production became much easier when I found and purchased an old electric kiln at an auction. I now could control the entire process in my own backyard. Soon more restaurants and good friends agreed to recycled their bottles and now my old Horse Barn is filled with "Bottles with Potential" and "Trays in Waiting". It is hard to believe that nearly 19 years have passed and we now participate in Art & Wine Festivals throughout the Western U.S. You will find a listing of my upcoming shows on the Events page and also lots of great photos to look through before you make your choice of designs. THANKS for your Business!! !